Citywide WLAN networks provide Internet access everywhere for everyone. In today's world there are end-user devices available in vast ranges of prizes and forms. Almost everyone owns or has access to netbooks, notebooks or mobile phones like the iPhone. A seamless integration of well-known services like you find in hotels, restaurants and airports nowadays can be implemented with our solution almost effortless also in open areas, e.g. in urban space and public places. Meshed networks consist of multiple network nodes. Every single node is connected with one or more network nodes, thus building a meshed structure. Data to be transmitted is forwarded from node to node until reaching the next interconnection point and therefore without the need for additional backbone infrastructure. 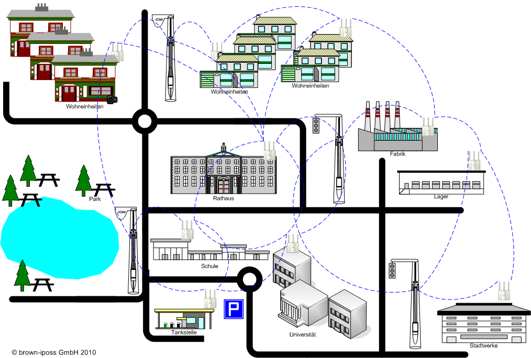 City-WLAN meshed networks span whole premises with only a very limited number of wired access points. These networks provide a cost-efficient and highly available connection that is rapidly implemented. Security of your data is important. Therefore we are using the latest encryption mechanism and security features to protect each transmission. SSL encryption is used when a customer authenticates at the gateway and additionally a VPN connection is established from the access gateway to the authentication server. The radio links of the wireless backhaul use WPA2 encryption to ensure highest security. Our Integrated Radio Masts blend extraordinary well into their environment and thus draw no unnecessary attention to them. All system components are mounted inside of the Integrated Radio Mast and invisible from the outside. Multiple antennas inside the Integrated Radio Mast allow to separate the backhaul and access networks. There is no additional cabling necessary. The created meshed network topology offers two big advantages: high availability and load balancing.